Richard Linklater is one of the most eclectic filmmakers in the business and his latest film, the military focused ‘Last Flag Flying’, adds another string to his bow. Set in 2003 at the height of the Iraq War, it’s a film that follows three Vietnam War veterans who reunite 30 years after the event to bury one of their sons who has been killed in Iraq. Linklater delicately balances raw drama with doses of humour, following these characters on a road trip where they explore the people they’ve became in the time since they first met, alongside wider themes of grief and patriotism amongst others. Bryan Cranston, Steve Carell and Laurence Fishburne play the three men and all of them are superb in their own unique way. In the period since they last met, time has moved on and they are all leading different lives. Doc (Carell) still works for the navy as a store clerk and has lost both his wife and his young son to cancer and war respectively in the past year. Sal (Cranston) runs a bar and is a functioning alcoholic (not mutually exclusive) and Mueller (Fishburne) has embraced religion and became a pastor. It’s a film about many things but I felt it was at its most interesting when it digs into the male psyche through these three men, who have little in common these days beyond a shared history from their time in Vietnam. It’s particularly prevalent through Bryan Cranston’s character Sal, the kind of guy who demands attention and could easily become too much to handle if Cranston doesn’t keep the balance right in his performance (which he does). Sal believes in honesty at all costs but he’s unaware of the impact this can have on the people around him, with one of the finest scenes in the film checking this approach superbly as the men visit the mother (played well by Cicely Tyson) of a friend who died alongside them in Vietnam. This film was based on a 2005 novel by Darryl Ponicsan (who also wrote the screenplay with Linklater), and that novel was a sequel to Ponicsan’s 1970 novel ‘The Last Detail’, which was adapted into a film with Jack Nicholson, Otis Young and Randy Quaid playing the same characters, so this is an unofficial sequel in many respects. 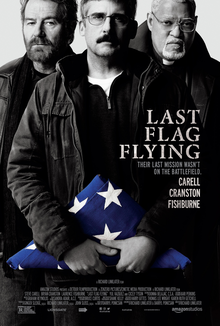 The film is a little too long and it doesn’t always get its points across with the clarity in which it is aiming for, but I thought ‘Last Flag Flying’ was well acted, explored interesting themes and I was moved by the perfectly pitched conclusion that delivered an emotional ending in tune with the way the narrative had unfolded.